Training Talk: Do Training Methods Matter? You are here: Home / Animal Training / Training Talk: Do Training Methods Matter? Although you may get sick of hearing this, the only two things trainers agree on is what the third is doing wrong. Today, that statement is not as true as it once was but if you ask anyone using modern training technology what they think of the training methodology used by the Dog Whisperer television show–most will wince. Recently over at Dolittler a post titled, Why veterinary behaviorists hate Cesar Millan attracted more than 200 comments. For some reason people become invested in public figures and television stars. Then, as part of their icon’s tribe, they feel that they have to defend that person and try to drown out any dissension. What is underlying that passion? I think that alternatives rock the very foundation that people cling to. The same thing happened with Steve Irwin of Crocodile Hunter fame. Those who spoke out against him faced a backlash of unbelievable proportions. In the eyes of many of those people, their icons (guru, etc., you pick the moniker) can do no wrong and their way is the only way. But the problem is that their way isn’t the only way–nor is it necessarily the best. During that first conversation I discuss the differences in what I do and feel out the client. I’ve been training long enough to know if I will want to work with the client (or not) based on that conversation. If I don’t want to and they are fans of Cesar Millan, I give them Cesar’s phone number. Because my job is not to change their mind or convert them to another way of thinking when they are resistant to it–my job is to help people and their animals. I’d rather put my energy into efforts that do some good so we all have fun. My training methodology has evolved with the times. Any good trainer will add more things to their toolbox and utilize what is appropriate for the animal and the client for the specific situation. Although many people think it is a cookie cutter approach–it isn’t. Sure there are only so many ways to shape, capture, or get a behavior but the nuances of the case are what determine what approach and methodology are appropriate. Plus I personality type the animal–which tells me what communication they will respond to the quickest. At the moment two of my current clients are converts to modern training methodology. One is having a tough time changing her habits (it takes about 30 days) because she used to train horses and tends to focus on the negatives rather than accentuating the positives. She has experienced some “Ah hah” moments and can’t believe how happy her dog is in school. All of my animal students like school. They enjoy learning, it is positive, and their entire lives change for the better. In many cases I’ve been called in after a so called “trainer” has worked with an animal. One of the worst cases recently was a dog that took three sessions to feel comfortable enough to come up to me. I’ll save you the gorey details but the dog used to run and hide in the back room when the trainer arrived. Didn’t the client know something was terribly wrong? A sensative and hyper-responsive animal, the harsh methods were not a good choice. Although this trainer was supposed to be credentialed–I highly doubt that she is. The problem is that there are a number of people in this area that are not really trainers who advertise themselves as such. It does everyone a disservice. 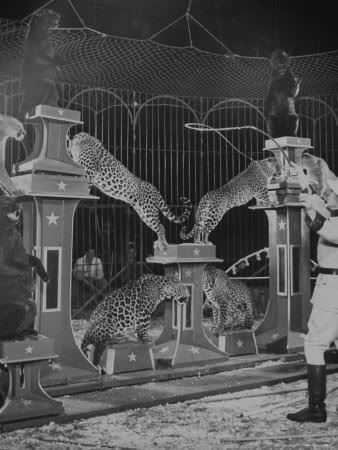 When I began my career there were very few training programs for animal trainers. Most apprenticed under another and learned the ropes that way. Today that has changed. Hands-on work is invaluable but the academic training is also essential to understand the complexity of training. As I said before, animal training is an art and a science. So–to get to my point, does the training method you choose matter? I think it does and I certainly hope it does to my clients since I spent a lot of money and time getting my degree in animal training and management. The question is ultimately up to the client to answer. I think what the television show the Dog Whisperer has done is to create an awareness that dogs need training (really it is the owners the dogs get trained whether the owner is aware of what they are doing or not). It has been good for the dog training industry at large. Later this week Victoria Stilwell, the television dog training star of It’s Me or the Dog will be in Santa Barbara. Aligned with some of the best behaviorists in the United Kingdom, Stilwell doesn’t seem to have the same popularity as the charismatic Cesar Millan. If you have not watched the different approaches–take the time to do so. In another post I’ll tackle some of the differences in training methodology–so stick around. What type of training methods do you use–and do you think training methods matter? How did you select your trainer? What television training show intrigues you and why? Please leave your comments below. I cannot agree more. Unfortunately, there continues to be a steady stream of unscrupulous people. I am not sure that they are unscrupulous–just ignorant and untrained and not very skilled at assessing their animal clients. From the article, “animal magnetism—which is felt on a visceral level—is something quite different from rank, leadership, and authority—which are purely mental constructs.